SQLizer has two priorities: data security and consistently smooth SQL conversions. Ensuring smooth conversion ranks pretty highly but nothing is more important than keeping your data safe. You’ve entrusted your data and SQL conversion to us and we take that extremely seriously. SQLizer follows industry-wide best practices and standards when it comes to security infrastructure. That means the whole of SQLizer is HTTPS-only, the same security protocol used by banks and online payment providers. And we never share data or information with 3rd parties. 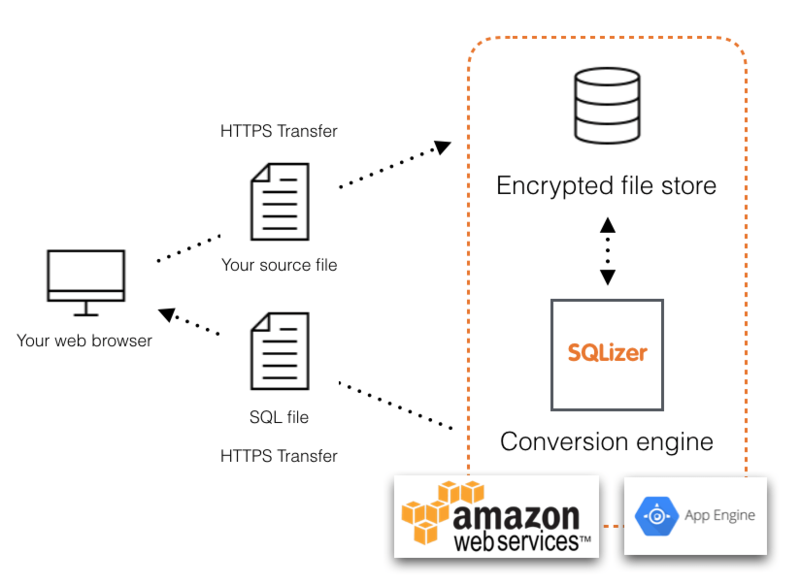 In order to convert your file into SQL database scripts, SQLizer uploads the file to our secure servers where the conversion process takes places. Once complete, you receive your converted file. Files are stored for 48 hours in secure, encrypted storage on AWS (Amazon Web Services). This ensures any file that takes a while to convert doesn’t get deleted before you’ve successfully downloaded your converted file. After 48 hours files are deleted forever and can’t be recovered. For our paid users we store files for seven days before deleting them, meaning files can be re-downloaded from their dashboard at any time. Paid users can also permanently delete files straight away. SQLizer is a paid-for tool with a free tier, meaning we aren’t driven to use conversion data for monetary gain - unlike many other conversion tools other that publish conversion data to the web or sell it to third parties. We are a completely transparent tool. You know where we store your data and why, how long before we delete data, and who we are (D4 Software Ltd). We built SQLizer because we were fed up of writing scripts to convert files to SQL. We published it to the web because we thought developers like ourselves would find it useful. We’re sure you will too but if there’s anything you think we could improve, let us know. If you ever have concerns about privacy you can find us on Twitter or send us an email. If you’re convinced how seriously we take security then convert your file now.